The UNCG Choral program is recognized for excellence, creative performances, and high artistic standards. 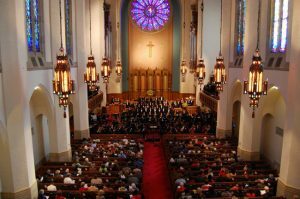 The UNCG Choirs are comprised of four ensembles: University Chamber Singers, University Chorale, Women’s Glee Club and Men’s Glee Club. These diverse offerings allow students the opportunity to experience a wide range of stylistic ideas through the exploration of music from various time periods including major choral-orchestral works as well as smaller chamber pieces. 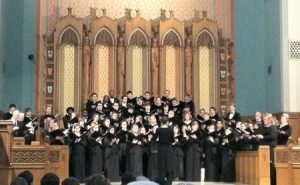 The UNCG Choirs have performed at state, regional, national and international conferences. Dr. Welborn Young serves as director of choral activities and conductor of the University Chamber Singers and Men’s Glee Club. Dr. Carole Ott serves as associate director of Choral Activities and conducts the University Chorale and Women’s Glee Club. The mission of the UNCG Choirs is dedicated to the teaching, performance, study and cultivation of choral music of the highest quality. We believe that the UNCG Choirs are a serious and distinctive medium of musical expression, of vital service and importance to its members and to UNCG. Through ensemble performance, we strive to create and environment of trust, communication, and expressive freedom, to present outstanding performances throughout the year, and to enhance the institutional sprit and character of UNCG. To music as an art and a profession, the UNCG Choirs seek to bring increasing artistry, understanding, and respect by efforts within our own immediate sphere and by providing leadership and sponsorship to school choral programs and through cooperation with all other agencies pursuing similar musical goals. Women’s Glee Club (MUP 381/681). This ensemble is open to all UNCG women. Placement is based on an audition for music majors, during the specified audition dates, and on an informal vocal assessment on the first day of rehearsal for non-music majors. The ensemble sings literature for women’s voices from all historical periods and styles: classical, sacred, secular, serious and lighter works from broadway to pops. Men’s Glee Club (MUP 379/679). This ensemble is open to all UNCG men. Placement is based on an audition for music majors, during the specified audition dates, and on an informal vocal assessment on the first day of rehearsal for non-music majors. The ensemble sings literature for male voices from all historical periods and styles: classical, sacred, secular, serious and lighter works from broadway to pops. Dr. Welborn Young is the conductor. Chamber Singers (MUP 388/688). The Chamber Singers is a highly select ensemble of approximately 22-26 gifted and talented pre-professional singers, music educators, and very dedicated amateurs chosen from the UNCG student body. Membership requires an audition. Preference will be given to singers able to commit to the ensemble for a complete academic year. Chamber Singers performs choral masterworks, new works, a cappella or instrumentally accompanied, in concerts throughout the semester including major works with orchestra. Dr. Welborn Young is the conductor. University Chorale (MUP 382/682). University Chorale is an ensemble of approximately 60 of the most gifted and dedicated singers from the UNCG student body. This ensemble prepares singers for a lifetime of choral participation as professional singers, music educators and enthusiastic amateurs. Membership requires an audition. The Chorale performs a full range of literature throughout each semester including major works with orchestra, standard repertoire for SATB choral ensembles, and chamber music. Dr. Carole Ott is the conductor. Mr. Brad McMillan, a native of Elizabethtown, NC, is the Office Manager and Assistant to the Director and Associate Director of Bands at the UNCG College of Visual and Performing Arts. In this capacity, his responsibilities include accounting, finance, graphic design, and monitoring the daily operations of the band program. He has studied at The University of North Carolina at Greensboro and Indiana University for degrees in Saxophone Performance. Brad has performed with the UNCG and IU Wind Ensembles, IU Concert Orchestra, Columbus (IN) Philharmonic, UNCG Symphony Orchestra, Casella Sinfonietta, and the Greensboro Symphony Orchestra. His affiliations include Mu Phi Epsilon Music Fraternity and the North American Saxophone Alliance.